Maspalomas is a popular holiday resort on the southern tip of Gran Canaria, adjacent to this trendy Spanish island's largest and most hectic package-tour resort, Playa del Ingles. Maspalomas though, is the quieter and more upmarket option, sporting the best four-mile (6km) stretch of golden, sandy beach on the island. Maspalomas is separated from Playa del Ingles by a spectacular undulating sea of sand dunes, a protected area that provides a habitat for some rare species of flora and fauna, and a favourite haunt for nudists. Along the Maspalomas waterfront the promenade, stretching to Playa del Ingles, bristles with bars, shops, restaurants and entertainment venues between luxury hotels and villas. Maspalomas also boasts an exhilarating water park and nearby are numerous other attractions like amusement parks, nature parks, a golf course, an aquarium and theme parks. The resort has become a favourite holiday destination for the gay community, with a designated gay zone on the beach and in the sand dunes. The resort's week-long Gay Pride festivities each May have become world-renowned on the party calendar. The main shopping centre in Maspalomas is the Faro 2 complex, full of designer stores and boutiques. Varadero Shopping Centre is another popular place to shop in Maspalomas. The surrounding area is crammed with shopping complexes of similar ilk, about a dozen in all, the biggest and best known being the Yumbo Centre in neighbouring Playa del Ingles. Maspalomas cuisine is best experienced at Pizzerria Piz Paz, Escalerita, El Palmeral or Velero Casa Antonio. 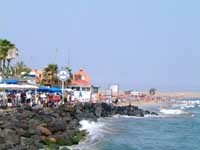 Maspalomas has restaurants aplenty, most very reasonably priced, offering a variety of international cuisines. Many of the restaurants provide live entertainment in the evenings and double as bars. Visitors can enjoy live music or DJs while trying out a range of different foods from pizza and pasta to Chinese, seafood and Tex-Mex. On holiday in Maspalomas, it is a good idea to make sure you join the locals in a traditional afternoon siesta in order to take advantage of the nightlife, which is lively but sophisticated. The holiday resort offers a plethora of entertaining bars with karaoke, jazz, salsa, and live bands to spice things up, or themed pubs with happy hours. A good selection of bars can be found in the Maspalomas Plaza. There are a variety of clubs and discos, two popular dance spots being found in the Holiday World amusement park. Most Maspalomas nightclubs only get going after midnight, and offer free entry, although drinks can be expensive. Those out for a real time on the town, however, will prefer to head for neighbouring Playa del Ingles where the hottest spots are, including the well-known Joy and Cream clubs. Those who prefer to do more than just laze on the Maspalomas beach have plenty of options when it comes to water sports, either above or below the surface, from paragliding to scuba diving. Enjoy the thrilling Aquapark, the Holiday World amusement park, a theme park centred on the reconstruction of an ancient Canary village, an aquarium, zoo and many other diversions. It is also possible to take excursions to various sightseeing attractions, like museums and monuments or scenic spots inland, or a boat trip to view whales and dolphins. A must for a Maspalomas holiday is a camel ride through the famous dunes. The Maspalomas Dunes are a haven for naturists, so be prepared to see plenty of naked bodies on the sand. The beach, particularly the sunbed area, becomes extremely crowded during the height of the summer holiday season.